A short but interesting biography starts the book off, talking about Alex Nino's career and the different projects he worked on. There are stories of him drawing figures in the sand with a twig, using shoe polish for inking, doing freelance illustrations, and then breaking in into the comics industry. The art collected are mainly his black and white comic book covers, comic panels, unpublished illustrations and a few traditional medium paintings. The style ranges from simple stylized designs to intricate line drawings with amazing hatching. It's cool to see the different style of inking. Sometimes they are fine and rough, sometimes bold and strong. Alex Nino has worked on Disney's project such as Treasure Planet, Mulan, The Emperor's New Groove, and Alantis. None of those production work are featured in the book, sadly. This book consists more of his work relating to comics. 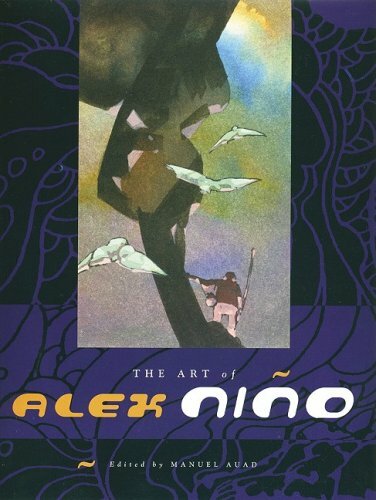 Overall, this is a nice volume for those who like the comic drawing style of Alex Nino.